Each weekend Ben Mueller-Heaslip and his partner make amazing vegan meats, then, Velovegan delivers those 'meats' all over Toronto - by bike. dandyhorse caught up with the founder of Toronto's only vegan food bike delivery service to find out a bit more about what it's like being vegan and working on two wheels. 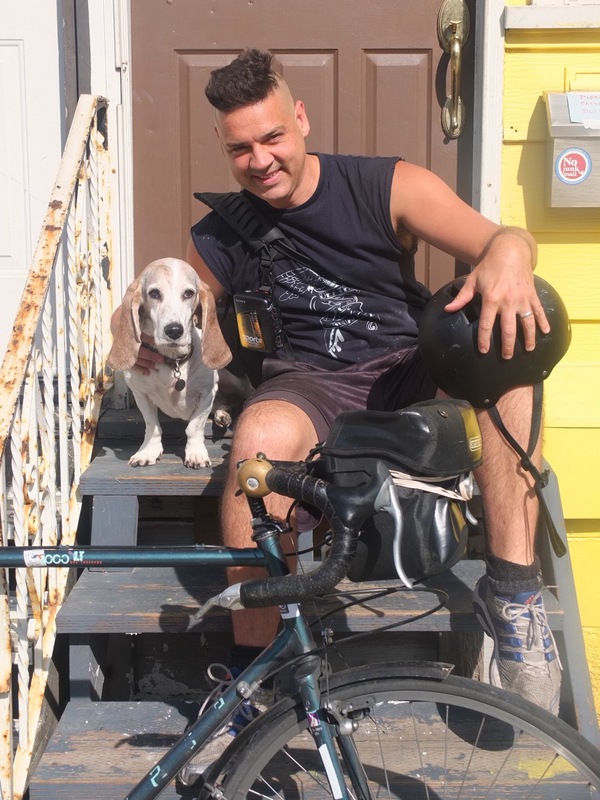 Velovegan founder Ben Mueller-Heaslip and his dog Madeline. Images courtesy of Velovegan. When and why did you start Velovegan? Well, it's hard to say when I started. I'd been developing recipes for vegan meats ever since I became vegan many years ago, mostly because there weren't as many options back then as there are now and most of what was available was pretty terrible. So I was making vegan meats, and it was way better than what people could get from stores, so my friends wanted some, then they started buying it and people I didn't know wanted to buy it, so I decided that I should go into business. It became official about two years ago. Why deliver by bike? Because it's just the best way to do the job! I cover most of the city, from Scarborough to the Humber River, and get every day's route done in a couple hours. It costs me almost nothing and it's mostly a lot of fun. I wouldn't be able to have this business any other way: the cost of running a car for business wouldn't let me make it the sort of business I want it to be. And I just hate driving. Driving is not fun. I'd have to pay myself way more to drive, so much more that I wouldn't be able to hire myself to do the job. Carrying the food is no problem. I worked as a bike courier for many years so my legs in good shape, and I've done a lot of cross-country bike camping rides where I've had to carry a lot more weight for a lot longer distances. I've got panniers and my panniers have panniers. When there are too many orders I hire my friend Smitty to ride for me and he's a fantastic courier. Now that business is getting really busy I'm trying to get him on as a regular employee. And since some stores have started carrying our products, you'll sometimes see me biking really slow with a big stack of orange crates full of burritos and pies strapped to the back rack of the bike. My meats are seitan, the base of which is wheat protein. It has the amazing property of being able to take on a great variety of textures depending on the process used to make it. My goal in making this stuff has been to create vegan meat that cooks the same way as the carnivores versions of the food. My father, for example, if he gets a package of vegan burgers or sausages from a store they stick to the grill of the barbeque and come out with the texture of either styrofoam or mush, because these things are badly made. My sausages, even my father can cook them properly. Just because you're vegan doesn't mean that your experience of cooking or eating should be any less than it would be if you're not vegan, and being able to barbeque a sausage is a nice part of life. Why did you decide to only do vegan meat instead of offering full vegan meals? Two reasons: first, every vegan already has vegetables so they don't need me to provide them. Second, a good business has to address a real need. Good, fresh, vegan meats, with a lot of variety, delivered at a good price is a real need and that's the service I'm providing. 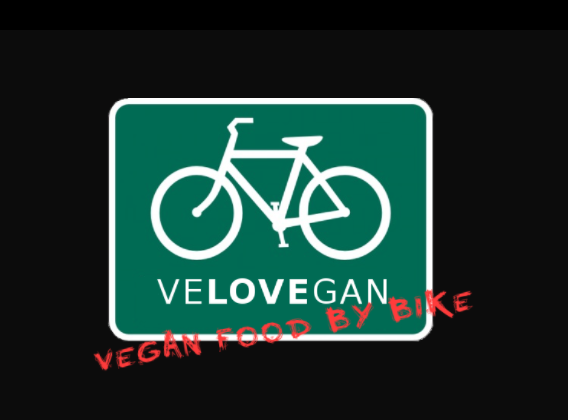 Do you know of any other vegan food delivery by bike services? Nope, I am the only one. There's a company in Minnesota that does it, but they don't deliver here. There are vegan restaurants that you can order from who use UberEATS and Foodora, but they're doing full meals and the delivery element is separate from the restaurant business. Unless there's something I haven't heard about, it's just me. Being on the road. I love cooking, but it's a damn lonely thing. I usually try to time my cooking sessions to start with the first pitch of a Jays game so I don't get bored. Business administration is not fun for me. My partner does a lot of that stuff and she's way better at it than I am. What I like is when that work is done, the bike gets packed, and then I'm on the road. A lot of my regular clients are really great people and we have ongoing conversations, about baseball, or cycling, or politics, or their pets. You get to know people seeing them every week and I really value that. I wouldn't want to do this work if it wasn't like that. Every Christmas I do a special run to give some presents and cards to the people who ordered most often during the year. Last year, one of my clients reciprocated my present by taking me and my son up for a flight in his little plane he's got at Buttonville airport, and he let me fly the plane. That was totally the best thing that's come to me from starting the business. How does delivering healthy food by bike make the city a better place? Toronto's a pretty tough city. Anyone who spends any time on the road here knows that, and they probably have a pretty good idea by now why it's that way. I'm trying to make a life for my family, not to change the world. But I'm trying to run the business right. When I started Velovegan I thought a lot about what it means run a business morally, and came up with a few principles: Nobody has the right to hurt anyone else to make money, make the product affordable to everyone, treat anyone working for you like family. I don't know if it makes a difference that a family on your street is vegan, or it their vegan meat is delivered by bike instead of a van. But doing things this way makes me feel like part of a community of people that cares about each other, and it makes me want to do it again every day. Yes! Velovegan meats are sold at Victoria's Whole Foods at 1450 Gerrard East, and that our burritos, pot pies, and Jamaican Patties are on the menu at the Sideshow Cafe at 1300 Gerrard. I'd give a shout out to Natalia and David at Lady Marmalade for giving me the use of their restaurant's kitchen in their off hours even though I've set off their burglar alarm so many times.